I started having problems with the ADC display using the adapter I built. It worked fine for quite some time then the display started to shut itself off and not be recognized by the system. Sometimes it would work to plug the cables back in. At first I thought it was the power supply I was using. I don't have specs on it, but the problem surfaced when the temperature climbed. The computer area was hovering around 90°F, and I assumed the power supply was sporadically failing. I bought a new-to-me 24V 1.8A supply for my 17" monitor (I think that might be a bit on the low-side, but it was only a couple dollars at a thrift store.) The problem persisted almost immediately. 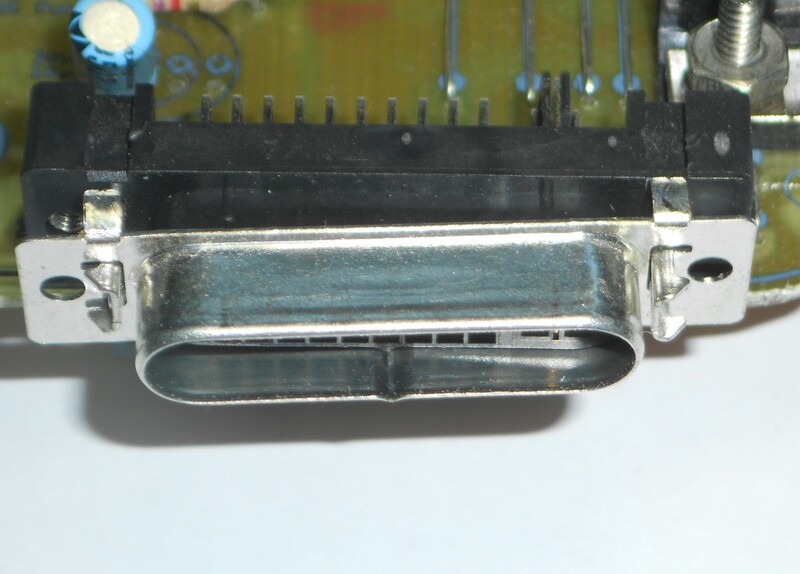 So I figured the monitor might be fried. 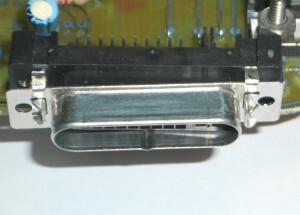 The ADC connector shield is loose. 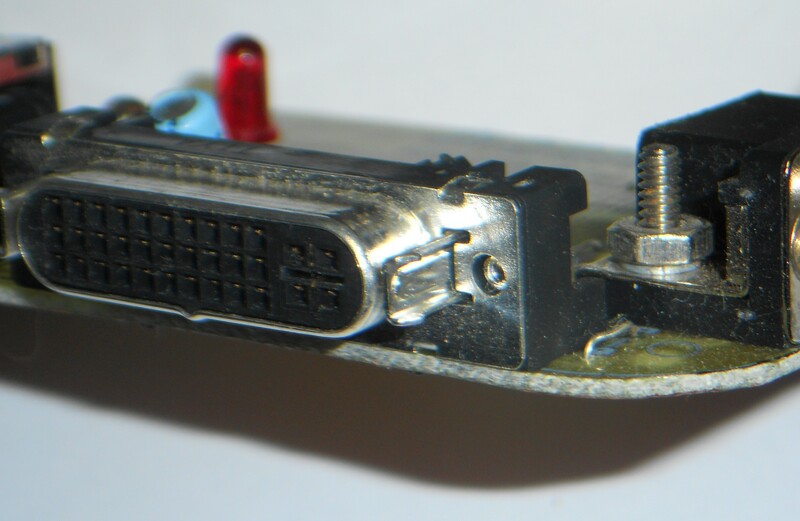 I had noticed the shield on the ADC connector on the board was not connected to the ground very well. I didn't think much of it — after all, there were half a dozen ground wires already. But on a whim, I thought I'd add a couple dabs of solder and give it a solid connection to the pins soldered onto the board. Surprisingly, that did the trick. So far it's been 2 days and the monitor has not flaked out! 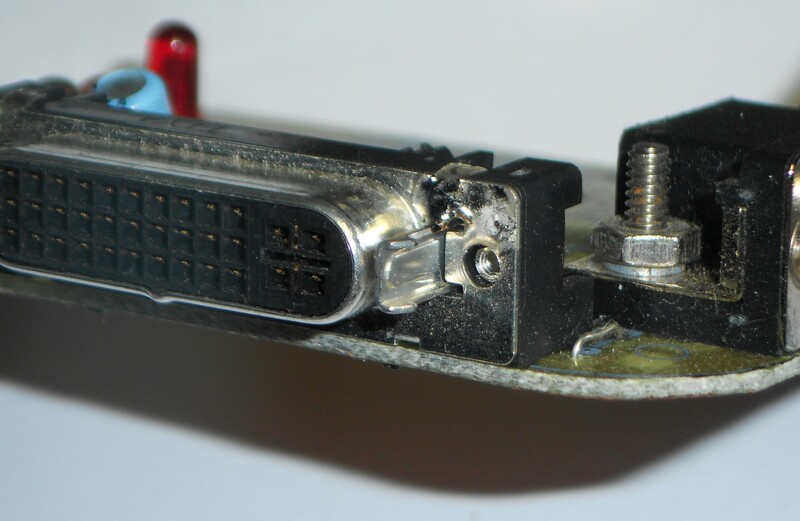 It may be the power supply is on the low-side to begin with (24V) and without the additional ground of the shield, the voltage drop crept too high in the other wires for the monitor to function. In any case, if you are observing sporadic problems where the monitor would shut off, apparently losing power, check the shield on the ADC connector and make sure it has a solid ground. Solder added to ADC connector shield.